Most people who frequent this website likely have four Craigslist tabs open at any given time, since it’s a reflex to check local car listings approximately every few minutes during the workday. But the folks selling those cars are in for a surprise come April 15, when Craigslist ups the list charge from free to $5. 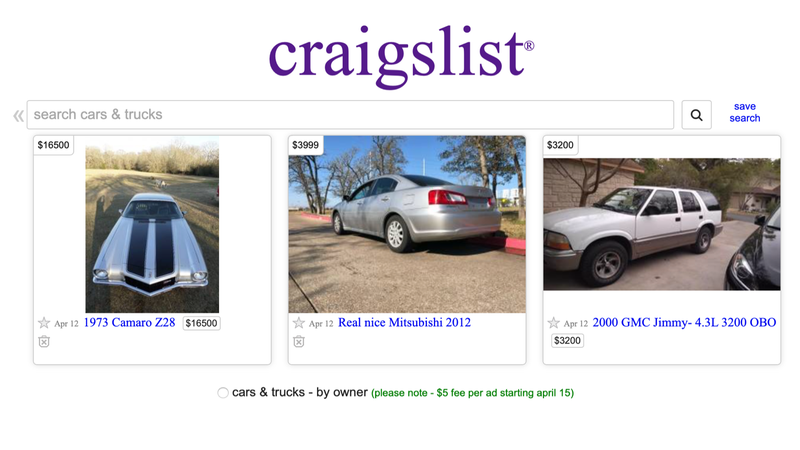 As Road and Track and Reddit noted today, the public announcement of the change can be seen by opting to post a “for sale by owner” listing on Craigslist, which takes a user to a page to click which category they want to put their listing in. The cars and trucks option has a green note next to it, telling users that on April 15, posting a vehicle ad by owner will no longer be free. That puts owner listings in the same boat as dealer listings, which Craigslist already charges $5 each for. Jalopnik has reached out to Craigslist for more information on the purpose of the $5 fee and to ask where all this charge applies, like whether it’s limited to certain areas. We’ll update this story if we hear back. It’s never fun for the person paying when things go from free to not free, but, in the case of Craigslist vehicle listings, this probably isn’t the worst thing. The car pages on Craiglist are full of scam and bot postings, and some are easier to pick out than others. (But no matter what, they’re still annoying.) Charging $5 per ad can help filter some of those ads out, without posing an astronomical charge for people just trying to get their car sold. It’s also not really that much money. Plus, our four tabs of Craigslist vehicle listings are all better off if they’re not half filled with spam, anyway.